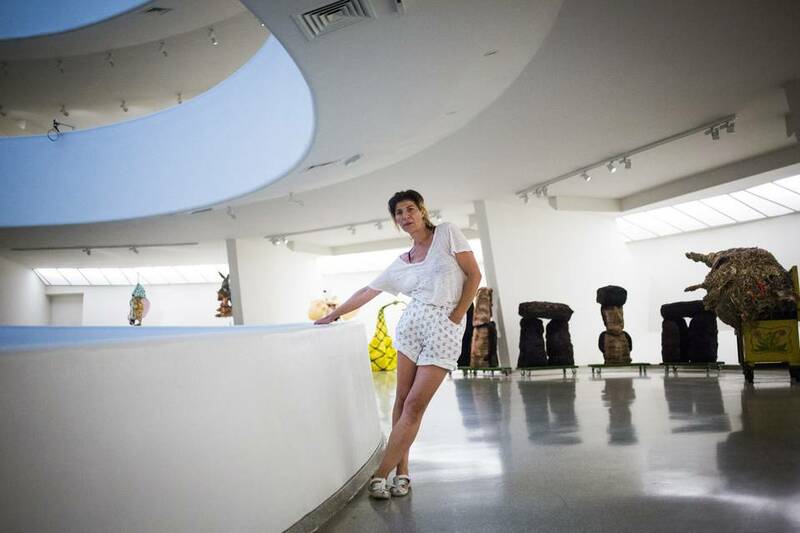 At the Solomon R. Guggenheim Museum this week, one artist is testing whether it is possible to revisit the wild, uninhibited nights of her youth—with a 24-hour dance party and performance event that peers back through time. “Stamina,” a new work by New York artist Agathe Snow, will employ live bands, DJs, a cash bar and a flashing light-up disco floor in an attempt to summon the spirit of a fabled downtown party she threw a decade ago. Starting Thursday at 6 p.m. and open to the public all night, the déjà-vu event will unfold alongside a 24-hour-long edit of archival video footage from the original party, playing on a nearly 30-foot-wide screen. The original, clandestine party—held in a vacant building near ground zero—drew a coterie of then art-world up-and-comers who were part of a gritty, often drug-fueled, downtown scene. Among Ms. Snow’s 300-some attendees back then were the photographer Ryan McGinley,one of the youngest artists to have a solo show at the Whitney Museum of American Art;Dan Colen, an artist now represented by the powerful Gagosian Gallery; neo-pop artistNate Lowman, and Ms. Snow’s late ex-husband Dash Snow, a graffiti-tagger-turned-artist who was a scion of the renowned art-collecting de Menil family. The original premise for the 2005 affair was a sort of dance-marathon contest, to be filmed for a potential TV show. There was live music by bands including A.R.E. Weapons, active then in the city’s electroclash scene. DJs spun tunes by the Smiths and New York Dolls member Johnny Thunders, whose 1978 song “You Can’t Put Your Arms Around a Memory” blasted through an especially festive moment. Nine cameras rolled throughout the night, filming dancers as well as staged bits of drama and interviews with bleary-eyed attendees. After a few hours, the dance-marathon concept went astray. “Now it’s more a documentary of all of us close to ground zero,” Ms. Snow said of her record of the energy and hedonism integral to her era’s downtown milieu. Much of the art made in Ms. Snow’s circle drew from the same anarchic, renegade spirit. Mr. McGinley’s early photos documented his cadre of friends—always in motion, often barely clad, taking drugs, sexually cavorting. Messrs. Snow and Colen, for their part, became known for ransacking hotel rooms into what they called “hamster nests,” complete with a bed of shredded phone books and tattered paper on the floor. The party footage in “Stamina” portrays that hard-partying, rebellious culture. “People were making out, I saw myself making out with some guy and have no recollection. It’s like this diary we kept away in a dark place and now it’s here for everyone to see,” said Ms. Snow. The illicit behavior took its toll, leading to the loss of many movers in the scene. An especially high-profile fatality was the young Mr. Snow, who died alone in a hotel room at the age of 27, of an apparent heroin overdose. A hanging mobile sculpture that Ms. Snow made as a portrait of Dash is currently on view at the Guggenheim as part of “Storylines,” an exhibition of contemporary art from the museum’s collection. Related work in the show, which focuses on art with narrative storytelling aspirations, includes photographs by Mr. McGinley—including one of Mr. Snow in a deli on Avenue A—and paintings by Mr. Lowman. The Guggenheim event will have a bar serving drinks until 4 a.m. on the rotunda’s ground floor, which will transform into a breakfast bar in the morning, with juice and muffins. When the museum opens for regular business at 10 a.m., visitors will happen into the party still in progress. “I actually don’t know how I’m going to stay up for 24 hours—I’m a bit terrified,” said Ms. Snow, who vowed she has parted with her wild, youthful ways. Now 39, she lives on Long Island with a partner and a 5-year-old son. But those downtown memories remain close to her heart. Dolna - Art updates from around the world. Watermark theme. Theme images by zbindere. Powered by Blogger.